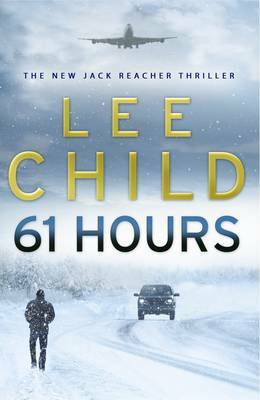 As I often write in my reviews of the Jack Reacher books, if you like them, you'll like the latest (in this case, 61 HOURS); if you don't, you won't. The novel is a typical Reacher scenario, involving a somewhat implausible set of events that only Reacher can analyse and, it is implied, solve. The pace is slow (each chapter or part-chapter ends with the phrase "n hours to go" to emphasize the seemingly interminable wait for the titular sixty-first). In the gaps between the relatively few action scenes, we learn a bit more about Reacher's seemingly uniquely tough powers and personality, including one event at the age of six, the first time his military file was "flagged". We also see him through the eyes of two women: the army commander of his old unit who has not met him but knows him by reputation; and a retired professor who is a witness in an upcoming drug trial. The sixty-first hour itself is very exciting, but unfortunately much of what has gone before is relatively tedious and over-signalled. Although Reacher is presented as being exceptionally talented, it isn't that hard for the reader to be one step ahead of him (at least) and indeed, he often sees events the wrong way round then, due to some crisis, has to revise his perspective. Nevertheless, the Reacher books are very readable page-turners, and this one is no exception. The events of this novel are based in South Dakota in the grip of a terrible winter. At the outset, a lawyer who has been visiting a criminal client in prison loses momentary control of his car while reporting the conversation over the phone to an evil mastermind (yes, it's that sort of book). A bus approaching in the opposite direction swerves to avoid the vehicle, skids on the ice and careers down the embankment of a bridge. Inside the bus are a group of elderly folk on a tour, and Reacher, who has hitched a ride in his nomadic existence criss-crossing America. After a few minor demonstrations of Reacher's strength, intelligence and chivalrous nature, the beleaguered travellers manage to get to the local small town despite the bitter winter, with the help of the strangely reluctant police force. Reacher soon establishes that not only are the police preparing for an external threat, but also that the town is in total lockdown owing to a community of bikers who have taken up residence at an abandoned stone building on the outskirts. The police don't know what the building is, but they are convinced that the bikers are involved in the drug trade, either manufacturing or distributing or both. One of these bikers has been observed selling drugs by a retired teacher, who is determined to give evidence against him despite threats against her life. The police have the unenviable task of both protecting the witness and having to fulfil the town's contract with the nearby large prison facility. In exchange for building the prison there, which has rescued the fragile local economy, the mayor has signed up to a contingency plan by which, if the prison's alarm siren sounds, the police have to go and take up positions on the perimeter of the prison's grounds - to a man and woman. Not a single police official must remain in the town. Hence, their current problem is how to protect their witness if the siren goes off. Holland and Peterson, the chief of police and his deputy, respectively, are convinced that the bikers and whoever is controlling the drug trade will orchestrate a prison break or other crisis in order to get the police out of the way so that someone, they do not know who, can kill the witness. The book is essentially about how they, with Reacher, attempt to deal with this problem despite being cut off from the outside world and largely immobile, owing to the weather conditions. There are, of course, many good things about this book. Lee Child is an internationally bestselling author and not without reason. His novels are written in an easy style that slip down with little effort. Reacher is an attractive character and his byplay with both women in this book is engaging. (If he survives this novel, which the author does not reveal, a meeting with the army commander has been set up as a probable next stop in his travels.) The minute details which are described throughout the novel are interesting in themselves, even if they do add up to rather a slow plot with a far-too-clearly signalled villain. I was impressed by the descriptions of what it feels like to live in an environment where it is so bitterly cold all the time. The ending of the book is thrilling. In summary, if you are prepared to accept the somewhat preposterous premises (there are several of them) of this novel, there's much to enjoy in it on a relaxing level. If, however, you set out to destroy its logic and common-sense, you won't find it difficult.